Receive notifications of new articles by e-mail. Since posting a few previous articles on mobile broadband, a few people contacted me for an update on how the providers compare. With Imagine launching their LTE fixed wireless broadband service earlier in 2016, both Vodafone and Eir have silently added larger 100+GB 4G mobile broadband plans, making for a more usable alternative to slow DSL, satellite and congested fixed wireless connections. I’ll also cover a few prepay options. Before deciding on any service, I strongly recommend checking the coverage for the particular network. For all three networks, a good way to start is to get a lend of a phone for each network and walk around the house including the loft if possible to find the spot with the strongest 4G signal. Then run a speed test such as with Ookla’s speed test app or testmy.net. This test is best performed in the evening around 9pm or when the Internet will most likely be used. For the Vodafone network, I recommend using their speed test Net Perform, which is available on iTunes and the Google Play store. Unlike other speed testing Apps and websites, Net Perform’s data usage does not consume the data allowance on Vodafone. This is particularly useful on small data plans as Ookla’s speed test App typically consumes 100MB per test on a 4G connection. Like Ookla, Net Perform measures the uplink, downlink and the ping (latency) as shown on the right. It also maintains a speed test history. For the Vodafone and Eir (Meteor) networks, the test results give a rough indication of what can be achieved with a dedicated router. For the Three network, I recommend getting the lend of a router and Three broadband SIM if at all possible. The Three network shapes traffic differently between handsets and broadband devices and appears to limit the range of how far the broadband device will operate from a mast. Based on my experience, broadband devices generally get considerably faster data speeds than mobile handsets on the Three network, particularly in a strong signal area. However, I also have been in an area where mobile handsets work fine the Three network with both 3G and 4G, yet broadband devices are unable to register with the network with a Three Mobile broadband SIM. If the phone does not switch to 4G mode inside, I recommend trying to force the phone into LTE mode to see whether it can pick up even 1 bar of usable reception. Desktop broadband routers such as the Huawei B593-22s have antennas far more sensitive than those in handsets. As a result, a 1 bar 4G phone signal will usually mean a moderate 4G signal on a dedicated router or stronger with an outdoor antenna. Despite all the hype over Vodafone’s performance, don’t assume Vodafone will perform better even when right next to a 4G Vodafone mast. For example, from my testing along various points between Kilcar and Letterkenny, I was surprised at the different speeds I got between Three and Vodafone. Over this period in 2017, the Three network was barely usable in the evenings along this route. These tests were run on a HTC U11 phone with the Ookla Speedtest app. The first where on the Vodafone network and the second set was after I ported to Three prepay. Although I ran both tests on a Sunday, ideally, I should have run them at similar times. However, even with running the Vodafone tests earlier in the day, Three performed better in the majority of the tests. The grey and blue shading indicates 4G and 4G+, respectively. The green indicates which network performed better in each test result. I plan rerunning the download tests with TestMy at a later stage. Ookla’s speedtest is a capacity tester by saturating the connection with lots of connections to the test server. TestMy tests with a single TCP connection, which would indicate the maximum transfer rate when downloading a large file or streaming, such as IPTV. This article goes into more detail. Although Three has better 4G(+) coverage around us, Vodafone has better 3G coverage. For example, I had 4G coverage on Three most of the way between Donegal and Ballybofey, whereas Vodafone dropped to 3G outside Donegal and didn’t pick up 4G again until entering Ballybofey. Between Killybegs and Mountcharles, Vodafone maintained at least 3G coverage, while Three fell to 2G (Edge) in a few areas. Eir is even worse, for example, Eir does not even have 3G coverage most of the way between Donegal and Ballybofey. There are many other parts of the country where Three is barely usable after 6pm, such as parts of Dublin. Basically, don’t blindly sign up to a contract just because a friend in another area is showing off very fast speed tests on the same network at their end. As wireless is a shared system, there can be a massive change in performance over the contract duration. For example, if a sales representative for Three manages to sign up a few dozen people in a particular area to Three broadband, there’s no doubt there will be a sharp drop in the peak time throughput on the mast serving the area. Vodafone’s largest mobile broadband offering is 150GB/month, extendible to 250GB with an add-on. Up until recently, the 150GB plan was only available by purchasing their 50GB/month plan, followed by a €10 add-on to increase the limit to 150GB. Vodafone now sell the 150GB package with its Vodafone B528 4G+ Router. The price is €45/month with a 24-month contract. They provide the router for free with the contract. Vodafone recently changed their SIM only contract lengths to 12 months (available on this page) and to between 18 and 24 months depending on the device choice. Their Vodafone B3500 appears to be a rebadged Huawei B315 desktop router. Unfortunately, the 50GB and 150GB plans are no longer available SIM only through their website. The Vodafone B528 is a rebadged Huawei B528. It features LTE Category 6 support (4G+ capable), Gigabit Ethernet port, 802.11ac (5Ghz Wi-Fi) and a VoIP telephone port. For those with a weak signal signal, it has two TS9 antenna connectors. See this page on 4gltemall for a review of it and detailed specification on this router. Vodafone now automatically caps the connection on their 150GB plan, preventing accidental excess usage (unlike Three). According to Vodafone, once the connection drops at the usage limit, the customer can call Vodafone to extend the limit. The customer can buy a one-off 10GB extension for €15 or extend the monthly limit by 100GB for €10/extra. The 100GB add-on takes effect from the next billing cycle (see update below). With the smaller and older plans, there are mixed reports on their forums about whether they can stop the user going over the limit. Excess usage is charged at 0.02c/MB (€20/GB). From what I have heard, Vodafone currently only provides 4G+ (LTE Advanced) access with mobile phone plans only. When using a 4G+ capable router such as the Vodafone B528, it may connect using one band only, usually the higher capacity band in a 4G+ coverage area. This should still provide up to 150Mbps of bandwidth depending on the signal strength and network load. Update 23rd January 2018: The Vodafone reps have given mixed information about how the 100GB add-on works. In the past, they said it adds 100GB one-off for the remainder of the current month, while more recently they said it takes effect from the next billing cycle. Update 24th May 2018: There are many users reporting performance issues with Vodafone’s B528 router, mainly DNS look-ups. I recommend checking this thread on boards for any updates before signing up to the 150GB plan. So far no one has mentioned about any issue with using the broadband SIM with another router. Eir owns the Meteor network, so it is no surprise that their Eir Mobile plans all operate on the Meteor network. What they don’t mention on their website is that they have two mobile broadband plans that are available on their own or with a fixed landline bundle. For those with an existing landline telephone, this can work out cheaper than getting a separate fixed wireless or mobile broadband plan while keeping the landline. Their standalone 4G mobile broadband plans are €45/month for 100GB and €60/month for 250GB, both on 12 month contracts. Like Vodafone’s 150GB plan, this 250GB plan price matches the Imagine broadband price. For those with a landline, they provide the option to move their telephone to them (if out of contract with another provider) where they deliver the telephone service by landline and broadband via the Meteor 4G network. The landline bundle which includes anytime, Mobile & UK calls is €62/month with 100GB data or €77/month with 250GB data, both on 18 month contracts. Further info can be found in their terms PDF documents: 100GB plan and 250GB plan. According to someone I spoke to who contacted Eir about this bundle, they charge €50 up-front which includes their 4G router. Eir’s excess usage is 0.002c/MB (€2/GB) for going over the 100GB or 250GB limit. Update 8th Sept. ’16: Going what I’ve heard (see comment below), Eir may not offer its mobile broadband plans to those who can get DSL on their phone line, even if the DSL speed is only 2Mbps. Update 17th Jan. ’17: I visited a couple who were able to avail of the Eir 4G mobile broadband. In order to avail of Eir’s mobile broadband service, they had to move their telephone provider back to Eir and were offered a bundle of 100GB mobile broadband data and anytime Ireland and UK inc. Mobile calls for €60 per month on a 12 month contract from what I recall them mentioning. The router they were provided is a Huawei B315 and is configured with the Meteor broadband APN (broadband.mymeteor.ie). The speed was very impressive for the time of evening, but then again they are in a rural area, so the cell tower they are picking up is lightly loaded. The speed test on the right was Monday evening about 8:30pm. Three has recently added an unlimited broadband (750GB fair usage) to its range for €30/month. This is either available SIM only or with a Huawei B525 router on an 18 month minimum contract. Their Huawei B525 router includes two rabbit ear antennas. Over the 18 month period, it actually works out cheaper than buying the B525 router separately while using a prepay phone SIM in the router for AYCE data. Unlike that unofficial method, Three will provide technical support and there is also a 14 day cooling off period when ordering the broadband package online. The 30GB, 60GB, 100GB and 250GB broadband plans are no longer listed on any of its device or SIM only plans. Customers on those plans can upgrade to the 750GB plan within the last three months of their contract. Only the tiny 3GB plan is available SIM only for new customers. At €16/month, I strongly recommend choosing another provider such as Eir’s prepay mobile broadband. For those that need a public IP address such as for port forwarding, change the router’s APN to “3internet”. The router may need to be rebooted for the public IP address to be assigned. If the IP address shown on the router’s status page starts with ’10.x.x.x’ or ‘100.x.x.x’, then it is a private IP address and port forwarding will unlikely work. Occasionally the router may get assigned a private IP address even with the 3internet APN. Should this happen, restart the router and it will usually pick up a public IP address again. Based on my poor experience with Three’s Technical support (see below) and what I’ve heard from others, I recommend going the SIM only (which requires buying the router) or considering the Rural Wi-Fi alternative below. For the router, I suggest going for the Huawei E5186s-22, which costs around £80. Like the newer B525, it is 4G+ capable, has gigabit LAN ports, 802.11ac Wi-Fi and two SMA antenna ports. By going SIM only, this avoids the risk of being stuck in a long contract should the service severely deteriorate after a few months. Warning: Three has the most severe excess usage charge of 0.05c/MB (€50/GB) and they do not provide any capability of preventing the user going over their limit. This also applies to their new “unlimited” / 750GB broadband offering in addition to their earlier broadband plans. Traffic shaping: Three enforces traffic shaping on its network, particularly during peak periods and with its rural masts. See this article for a traffic shaping demo, compared side-by-side with other networks. As a quick example, compare the above right speed test against the following file download from Heanet, both tests performed one after the other during peak time. 435KB/s is only 3.48Mbps. The bottleneck is certainly not at Heanet’s end! From my own testing, Three applies the same traffic shaping to their broadband contract customers as they do with their prepay phone customers. This includes prioritisation of certain services such as YouTube and some CDNs such as Cloudflare and Google. On the other hand, the connection appears to be more stable than using a phone SIM and they will provide technical support. The unlimited broadband contract also includes a free Huawei B525 router, useful for those who don’t already own a suitable router or would like to upgrade theirs. Update 7th March 2018: It appears that Three was traffic shaping in the UK also. Three (and Vodafone) in the UK are to be investigated by Ofcom, the UK telecoms watchdog. They are accused of slowing down certain types of traffic, including data roaming. On the plus side (for me), Three has upgraded the mast in my area, providing a substantial improvement in the 4G speed I get here, even peak time. For anyone that had bad performance before with Three, it’s certainly worth giving them another test run such as with a prepay SIM. I did not expect this to happen given our rural location and no sign of 4G from Eir/Vodafone yet around here. After escalating the issue with Three, they could not find any fault with my service and that I’m getting good speed. They don’t seem to care about my connection stability, as long as the speed is higher than 0.5Mbps when it’s up. Despite sending them numerous screenshots including the above ping test, they insist that my connection is fine. So far, I have been able to get around this issue by positioning a dense obstacle in line-of-sight of that new mast. My signal has taken a hit as it’s difficult to block the mast without partially blocking the local mast as there’s about a 30 degree angle between the two. I plan posting an update later once I get hold of some new band 20 directional antennas, as this would make a good isolation test on directivity. Update 9th April 2018: I have two new Wittenberg LAT 22 antennas set up and these are doing a great job at at isolating the local mast. Better signal readings, more consistent throughput and no more drop-outs. I plan posting more about these in a new article when I get time. Please note that these LAT22’s are band 20 only. Update 1st October 2018: Someone contacted me to mention that Three’s unlimited plan is now available SIM only on a 30-day rolling contract. Despite its name, Rural WiFi is actually a Three/Vodafone reseller and are a partner of Fleetconnect, the provider of Wi-Fi services on public transport such as Bus Eireann, Dublin Bus and Irish Rail. They provide a choice of three packages – 100GB, 250GB and unlimited data, all on an 18 month contract. Their plans are priced at €48, €58 and €65, respectively. However, they usually discount these prices anywhere from a few months to the contract duration, varying up/down a few Euro depending on their promotion (see note below). They include a 30 day guarantee, twice as long as the standard 14 day cooling off period. They loan a mains operated desktop router on a returnable €65 deposit for the duration of their service, plus €15 for next day shipping. They appear to use the Three network directly for the 250GB and unlimited plans and Vodafone for the small 100GB plan. Going by feedback and posts I came across on Boards.ie, they use a variety of routers. These include the Teltonika RUT950, D-Link DWR-953 and TP-Link TL-MR6400. Earlier customers received the D-Link DWR-921. Their customer service is reportedly a lot better than Three and Vodafone’s own broadband plans and their data speeds are also reportedly better than Three. I still have yet to hear anyone complain about their customer service. One Rural Wi-Fi customer contacted me to say that Rural Wi-Fi does not have excess data usage charges. I have also seen a few people mention the same on the forums. The connection drops once they use up the data allowance. Rural Wi-Fi provides the option to upgrade their subscription (e.g. 250GB to unlimited) to increase the allowance. Note: Unlike the other providers, Rural Wi-Fi regularly makes drastic changes to its promotional pricing. For example, they usually vary the promotional discount and duration every few weeks. As a result, if the offer does not seem that good at present, check back a week or two later. Current pricing and further information on Rural WiFi are available on their official website. All three major providers offer a 7.5GB prepay plan which is worth considering before entering a lengthy contract. This can be useful if it is difficult to get a lend of a phone or broadband SIM for a certain network. The obvious catch is that the user needs to obtain a suitable router to try the SIM in. My recommendation is to get a Huawei B593s-22 second hand off eBay, which is typically priced around €60 to €80 including delivery. Although this router lacks the LTE Advanced capability of some newer routers, it reportedly provides the best internal antenna sensitivity of any desktop 4G router making it better suited for those in weak signal areas, especially where the user wants to avoid or cannot install an outdoor antenna. The B593s-22 also has a high resale value where the user can recover most of the cost if they go with a contract plan that includes a free or discounted router. SIM card note: Each network now issues a trio SIM card regardless of its intended use. This is a modular SIM card that splits apart to fit mini, micro and nano SIM slots. Most routers require a mini size SIM. If you accidentally split the SIM apart, these pieces snap together again. This can also be useful to swap a SIM back and forth between a router and a phone that require difference size SIM cards. The following options below are a few prepay plans worth considering for those who do not want to sign up to any contract. Vodafone’s largest prepay mobile broadband bundle is a puny 7.5GB for €20 each 4 weeks. However, this should be sufficient for testing the network before signing up to a lengthy contract. Vodafone is the only network that officially supports phone and mobile broadband use with the one SIM card. Just order a Vodafone SIM (new number option) from their website or buy a Vodafone SIM instore. The SIM costs €10, but this will be given back as €10 credit once the user registers for My Vodafone. When registering for MyVodafone, it will ask whether the SIM will go into a phone or a data device. The user can later change this setting. Be sure to use the correct APN for the corresponding bundle, as explained in this article. While Three and Eir (Meteor) phone SIMs work in data devices (see below), they do not officially support such usage. The Vodafone X (student) plans offers the largest data bundles with prepay on the Vodafone network, intended for handset use. These plans target students, however, they have since relaxed the sign-up requirements. New and existing Vodafone prepay customers can avail of a Vodafone X plan by sending an SMS “music”, “weekend” or “sport” for the corresponding plan to 50222, then top up by €20 to pay to activate it. The Vodafone X WEEKEND plan offers 20GB for €20 per 4 week interval, plus unlimited weekend data (20GB fair use each weekend). Tethering reportedly works, however, Vodafone branded phones such as the Smart Ultra prevents tethering with the live APN. Attempting to tether with the ‘hs’ or ‘isp’ APN will incur out-of-bundle charges. Another workaround would be to place the SIM in a router and set the APN to live.vodafone.ie. If the router has a telephone socket (e.g. Huawei B525), plug a corded telephone into the router’s telephone socket to make/receive calls using the voice minutes. Note: It can take a day for 4G to activate on a new Vodafone prepay account. Their support chat service can usually override this. Vodafone also has a known issue where 4G can randomly deactivate, which requires contacting their support to reactivate. Going by numerous reports in the Boards.ie midband forum, many have been using Three’s prepay phone SIM as their main home Internet connection, some for years. Three prepay phone SIMs provide “All you can eat” data without having to do anything other than operate the SIM in a phone handset for its first use and top it up by €20 each 28 day cycle. Although not supported or permitted according to Three, they do not actively prevent such usage at this time. However, they do appear to randomly block the connection. When this happens, Internet connectivity drops even when the router is rebooted or still shows a connection. When this happens, the SIM is generally only temporarily blocked. When the router is switched off for roughly 5 minutes, the SIM will work again. From my own testing, Three no longer gives network priority to their official broadband SIMs like they did in the past. On the other hand, Three will not provide support if there is any technical issue as they can identify the device the SIM is placed in. Three also has a much larger fair usage allowance of 750GB compared to the 60GB/cycle with a phone SIM. This means there is a greater likelihood of Three throttling the connection for excessive usage with a phone SIM. The official fair usage limit on prepay phone SIMs is 60GB/cycle after which Three may throttle the service, so it is unlikely users will run into any issue if they keep their 4 week usage below this. I have not come across anyone on Boards mentioning they were cut off for excess usage, but heard a few that were throttled to 1Mbps temporarily after very heavy usage. Beware: Do not attempt to use any bill pay phone SIM for tethering or use in a modem. There have been reports of users running up very large bills in excess of €1000 for tethering. This is especially the case with business, iPhone and former O2 plans. Traffic shaping: Three applies extensive traffic prioritisation and throttling to its AYCE service during peak time periods. Speed tests are practically meaningless as a result other than for off-peak testing to check the equipment / antenna. From my own testing, YouTube is clearly prioritised and often has no problem streaming at 1080p in my area. Downloads on the other hand are heavily throttled to as low as 500Kbps (64KB/s). For example, various speed tests such as Ookla, Fast.com and TestMy report 500Kbps to 2Mbps, while the ‘Stats for Nerds’ in YouTube can hit as high as 30Mbps right after the speed test. Three Visitor SIM: Three has introduced a Visitor prepay SIM, intended for tourists. Unlike Three’s regular prepay SIM, the Visitor SIM clearly states it provides a 60GB allowance with each €20 top-up. For comparison, the regular prepay SIM provides All You Can Eat data (60GB fair use, 2TB hard limit) with each €20 top-up. It is quite possible that the visitor SIM does not enforce a maximum roaming duration period limit other than a 5GB EU data allowance. Early in 2017, Meteor (now Eir) increased their prepay Mobile Broadband plan bundles which make them better value than using their prepay phone SIMs for broadband. These bundles are €20 for 15GB of data and €30 for 50GB of data, both with a 30 day limit. The 50GB plan can be renewed the moment it runs out by just buying another 50GB add-on. Update 22nd March 2018: Eir recently reduced the expiry of its 50GB data bundle from 180 days down to just 30 days, even for existing customers. Once the existing 180 day bundle runs out, the largest bundles available expire after 30 days. Note: For a few weeks after Eir shutdown the Meteor website, the largest prepay mobile broadband bundle they listed was 7.5GB for €20. According to Eir, the 50GB prepay bundle is available to affected customers by request by calling their customer care team on 1905. Prepay broadband SIM cards with 15GB/50GB bundles are available again on this Eir webpage. Prepay broadband customers that have a SIM card with the former Meteor branding are unaffected. A top-up is necessary at least every 6 months to keep the SIM active. For example, if the SIM will be for backup, top it up by €5 each 5-6 months. Should an outage occur, top it up by the value to bring the credit up to €30 and purchase the 50GB add-on. If your usage is light enough such that the 180 day pass lasts the full 180 days, be sure to top-up by €30 before it expires. When my 180 day pass expired on me, it initially brought up the webpage to say that my pass expired and then the signal disappeared. Initially I thought it was just a coincidence that the network went down. However, when the signal was still down a day later, I contacted Meteor support. The agent told me that my SIM was deactivated as it had not received a top-up in 6 months. This is not surprising given that this coincides with the length of the 180 day pass. So I had to send a €30 top-up to the SIM # (I could have told the agent my voucher # if I had one) and then the agent reactivated the SIM. Although not officially supported by Eir, their prepay phone SIMs will work in a router using the APN ‘data.mymeteor.ie’. This can be a useful way of making use of their 20GB 4G prepay simplicity plan for €20/28-day interval or even the cheaper 7.5GB 3G simplicity plan for €10/month. To avail of the plan, the user needs to send the SMS ’10 data’ to 50104 for their 10GB 3G plan (see note below) or ’20 calls and data’ to 50104 for their 20GB 4G plan before applying the first top-up. After this, the user just needs to top up the SIM each 28 day cycle to keep the plan active. For users in a strong Eir 4G signal area, a worthwhile suggestion is to switch their mobile phone plan to Eir for the €20 calls & 20GB plan as this way they can make use of the unlimited calls and use the data between their handset and for tethering. This is also a great way to supplement another limited broadband plan. For example, if a user is on one of Three’s mobile broadband plans and struggles with speed in the evening, they could tether from their Eir handset in the evening when they need the speed. If the data plan runs out, Eir cuts off the data connection and presents a landing webpage with a choice of options. The €5 booster option provides an extra 500MB (=1c/MB or €10/GB). Do not choose the ‘Out of bundle’ option! Their largest prepay data plan with a phone SIM is €40/28-day period for 35GB of data, which is a combination of the 20GB with calls plan for €20/28-day period and a recurring 15GB bundle for a further €20/28-day period. The 15GB recurring bundle is available in ‘My Eir’ and as an option on the landing page that appears when the user uses up their main data bundle. For those heavy into social media, it is worth noting that Eir’s €20 (and €30) simplicity plans include unlimited (60GB) of YouTube, Facebook, Twitter, Instagram, Snapchat and Whatsapp usage, including video content hosted on these social networks. Note: Eir (Meteor) no longer advertises the €10 data plan, so that option may no longer work. Previously if the user sent the SMS ’10 data’ 50104 with a phone SIM, they got 7.5GB for 30 days (now 28 days) and the connection was limited to 3G only. This data plan did not include unlimited social media or YouTube. Opel provides in-car Wi-Fi on Opel cars that come with its OnStar service. It is basically a mobile broadband router built-in to the car. Opel uses the Vodafone 4G network and users can fully utilise the data plans across most of Europe. OnStar currently provides a 3GB trial plan, which lasts up to 90 days. While 90 days may seem like a decent trial, a trip with a few kids using Tablets will gobble that up on a single journey! That was the first impression I heard from someone who just bought a new Opel Crossland X.
Vodafone operates a separate prepay service for in-car Wi-Fi than it offers directly to consumers. They call it their “Internet in the Car” service, which has different data rates to their regular prepay mobile broadband plans. They operate out of the UK based on speaking with someone who had to contact their technical support. It is possible to queue up to three bundles in addition to the active bundle. According to Opel, one must have an active OnStar subscription (€10/month or €100/year) before they can purchase Wi-Fi data. Regardless of the usage, I suggest going for the 100GB bundle as this will work out the cheapest in the long run. With very light usage, this works out at €10.50/month for roughly 8GB a month over the year, in addition to the OnStar subscription. 23rd June 2017 – Three reportedly apples traffic shaping to broadband SIMs. 18th July 2017 – Revised Meteor broadband on renewing the 50GB bundle. 21st July 2017 – Added Vodafone prepay broadband. 24th July 2017 – Added note above Meteor renaming to Eir. 5th August 2017 – Clarified how to get a Vodafone prepay broadband SIM. 5th September 2017 – Added section on Opel OnStar. 8th September 2017 – Eir drops the Meteor branding along with the 15GB/50GB prepay broadband bundles on their website. 18th September 2017 – Revised the Meteor prepay broadband section with the new Eir branding and added a note about Vodafone’s Net Perform App. 27th September 2017 – Eir now lists the 15GB and 50GB prepay broadband bundles. 6th October 2017 – Vodafone drops the price of their 150GB 4G package. 50GB package no longer available. 25th October 2017 – Revised the Rural Wi-Fi section about the usage limit and router offering. 16th November 2017 – Vodafone now offer a 100GB add-on with its 150GB plan. 4th November 2017 – Added note about Vodafone 4G+. 10th January 2018 – Updated Rural Wi-Fi with 12 month contract pricing. 16th January 2018 – Added Three’s new 750GB promotional plan. 23rd January 2018 – Revised Vodafone section. 22nd February 2018 – Added note about recent Vodafone performance issues. 27th February 2018 – Revised the Three broadband sections. 7th March 2018 – Vodafone performance issues appear to be fixed. Added update to Three broadband section. 22nd March 2018 – Revised Eir prepay broadband – They reduced the 180 day 50GB pass to just 30 days. 27th March 2018 – Added update of my recent experience with Three. 9th April 2018 – Updated Rural Wi-Fi with rough pricing as they keep altering their prices. 24th May 2018 – Various Vodafone users are running into issues with Vodafone’s B528 router again. Moved obsolete iD Mobile section and Eir 180 day plan advice to Archive. 4th June 2018 – Added a caution about assuming Vodafone is the fastest. It’s certainly not the case around Co. Donegal! 21st August 2018 – Revised the Vodafone prepay section now that Vodafone relaxed the Vodafone X sign-up requirements. 21st November 2018 – Rural Wi-Fi’s 100GB plan uses the Vodafone network. Eir simplicity prepay now offers 20GB per 28-day invertval. great article, i actually rang eir and was transferred about for a bit. Finally found someone who know what I was tlaking about but advised that because I can get standard dsl (2mb) I cannot avail of the 4g mobile broadband promotion. I don’t think meteor has 4g where I am anyways so I am going to approach VF about their plan (we definately have VF 4g). That’s a real bummer that Eir will not provide the 4G mobile broadband where one can get barely usable DSL. I can understand if they didn’t provide it to those that can get VDSL, but it doesn’t make sense that they refuse to offer it to anyone that can get DSL no matter how slow the DSL link is. Thanks for the info. Yes a real shame, Dennis Naughton has a live Facebook Q&A session on broadband rollout next Tuesday 13th it may interest you. I went with VF 150GB, great speeds but I data cap means is not a feasible service for a family connection. I’ll just keep plaguing VF until the review their packages again. I need to get one or are they hawking one off on me. I have googled and cannot find anything about FMS. Perhaps you might know something/ Thanks in advance. Chris. I have actually no idea what FMS is either. What I suspect is they want a dedicated mains operated router instead of a portable device, i.e. FMS Router possibly means Fixed Mains Supply Router. Portable devices tend to be more resource heavy on the network as their smaller internal antennas are not as sensitive. The last person I spoke to that got that package got a Huawei B315 from Eir, which is a mains operated router. Mains operated routers are generally more sensitive (and in turn better speed), provide better Wi-Fi range and LAN ports (like a DSL router). That router is around £100 on Amazon, so the €50 would be cheaper than buying it or similar router elsewhere. If you no longer need the Huawei e5577, it would be worth asking Eir for an unlock code. A used unlocked e5577 is currently around €70 on eBay, so you could try selling it to recover the cost. Great article. Really interested in this as I currently use meteor mobile broadband (have done for over a year) – I get there heanet package €19.99 for 50GB – 6 month package which continues after. I had major problems with signal strength until I got this https://www.irishwireless.net/3g-4g-antennas/xpol-a0001 – broadband antenna. It connects into the back of the B315 and I have gone from 2g to 4g with 15mb download which is pretty constant. I would be a heavy user of Netflix and streaming online but have 2 times gone over limit – I then use a 3 pre pay sim which I top up my 20€ when this happens – I have an old Mifi thing I put this in and it connects to the antenna too. I find the out of bundle data too expensive with meteor. I have noticed at the back of my house recently I have started to get 4g on my phone in the house – this never happened before so am considering moving my antenna to the back and seeing if the signal gets stronger. I can get 25mb download on my phone when outside. The antenna has been a lifesaver. We don’t have a phone line in the house so mobile broadband is our only option. If your excess usage under 25GB/month, another option would be to get a Meteor prepay data SIM. It costs €30 for a 50GB and lasts 180 days. So if let’s say your average excess is 15GB/month, that 50GB bundle would last just over 3 months, working out at about €10/month for the excess usage. However, if your excess is 30GB+/month, then the Three AYCE SIM is the way to go if you get decent speed on Three. In my area, Three’s 4G peaks over 40Mbps early in the day, but is currently 1Mbps at 10:45pm going by TestMy, which measures the sustained speed similar to a YouTube stream. I might put together another article on antennas as I do get quite a number of people asking me questions on these. For example, although the Omni-directional antennas can pick up the signal from any direction, its horizontal element is actually directional, so aiming the antenna can make a noticeable difference to the download speed as 4G makes use of both the vertical and horizontal elements, each connected by a separate wire to the router. Great to hear that your antenna is working well. Thanks for the advise on meteor sim for additional internet. Might just get that and at least it would work in the B315 as it’s locked to meteor and I could get rid of my other old mifi. My excess usage would usually be 10gb. Must take a look at my antenna after your comment on positioning. I get pretty good speeds already but more speed would be good. I’ve been using Three Prepay All You Can Eat data as my main internet connection for 2 years now. Equipment is Xiaomi MiFi AC USB router with OpenWRT (ordered form AliExpress, 25,- EUR) and Huawei e3372 4G USB modem (30,- EUR from eBay). Works like a charm (streaming – Netflix/Youtube, browsing, FaceTime/Skype, even heavy downloads). I’ve had months with more than 500GB traffic and I’ve never been throttled. The speed has started to decrease lately, possibly due to lots of people doing the same as I do, though. My house is about 1/4 mile away from Three’s cell tower (my modem sits in the window, in the line of sight to the tower) and I get between 15-25 Mbps download and 5-15 Mbps upload when testing with Ookla Speed test, depending on time of the day. If you need help with the setup, comment here. very interested in how to set up? also i can only seem to find contract all you can eat sims.. would they work the same? Reply here if you have further questions. I had been on ID Mobile 60GB plan for €30 per month but found that I got better speeds with Eir 4G so decided to go with their 100GB plan at €45 per month but after first month found I exceeded my 100GB which was not an issue on the ID Mobile 60GB service. I have since found out that Eir’s 100GB is based on upload plus download which I think is why I exceeded my limit. So now I am paying €45 per month for a package that seems to give me less than my previous €30 id mobile package did? Thanks for the update – I revised the Three AYCE section. They also recently seem to be hitting hard with traffic prioritisation and throttling in recent weeks. For example, there is a substantial difference at peak time between the throughput YouTube gets compared to what a file download gets. great thread, do you know anything about regional broadband? they seem to offer unlimited mobile broadband at various speeds for quite reasonable prices. 15mb download speed for 50 euro unlimited data. Do you know which network they are using? Regional Broadband uses a proprietary wireless network, which means that they need to provide the correct antenna and carry out the installation. Unfortunately, I had no luck finding out what type of wireless network they use, let alone the sector capacity. If possible, try finding someone in your area that is currently on Regional Broadband to see what their experience is like. If you have no luck finding anyone using the service and would like to go ahead, be sure to carry out some extensive testing on the first day or two, such as in the evening most people go online. By law, there’s a 14 day cooling off where you can cancel if it’s not up your satisfaction. As for the package, I suggest going for the cheaper 5Mb or 10Mb package unless you need the faster upload speed during peak time. As with most wireless providers, you will probably only experience the faster download speeds of the higher packages early in the day. For example, let’s say high peak time contention brings the speed down to 5Mbps, then none of the higher packages will offer any benefit for the download speed, unless they also use traffic shaping. Unfortunately I’m not aware of any way of getting other traffic to be seen as social media traffic. Their usage monitors likely checks for traffic across certain IP ranges to determine whether it’s social media/YouTube or other traffic. What I have heard a few do is use a combination of a Meteor phone SIM with a Meteor broadband SIM. This way they do all their YouTube streaming with the phone SIM and run everything else with the broadband SIM. Unfortunately this doesn’t work with other streaming services such as Netflix as YouTube is the only streaming service Meteor includes in its “More than you can eat” feature. Fantastic article – I’ve been with Rural WiFi for about 6 months now on the unlimited plan, typically getting pings of 28ms, DL of 30Mbps and UL of 45Mbps, so very happy with that given that we are a very heavy usage house. For those that are interested, I was issued the D-Link DWR-953 rather than the 921 mentioned here. That’s great speed there, certainly a lot less contention on the site compared to around here. The 45Mbps uplink indicates that this is a 20MHz site (1800MHz band). Going by D-Link’s spec, the DWR-953 appears to be a newer model with the addition of 802.11ac Wi-Fi. Hi Sean, I tune into your posts every so often for updates to items that may interest me, hence why I have the 180 day Eir mobile package which is now coming to an end, can you confirm if I switch to Meteor, I should get the same signal if they are both run off the same network. I have a deck phone connected to to a tp link router using goldfish as the provider. I see you mention meteor has a 30 day 750gb option. What I don’t like about this, is the fact one can go over the limit with no notification. Do you think this is the best value opton for home broadband where no other option i.e. satellite or fibre etc. is available to me. It is Three that is providing the 750GB option. I don’t recall Meteor ever providing more than 50GB in any bundle before Eir got rid of the Meteor branding. Eir and Three have their own independent masts and network. Here in Co. Donegal, there are very few places where Three lacks 4G coverage that is covered by Eir 4G. So there’s a good chance you will have a similar or stronger 4G signal with the Three network. As Three’s network has heavy peak time congestion in some areas, I recommend giving Three a test run with a prepay Three SIM before signing up to the 750GB contract. For example, try testing the performance between 8pm and 10pm, which is generally when the network has the highest congestion. You can do this with a Three prepay phone SIM (although Three don’t officially support doing this), i.e. buy a Three phone SIM with a €20 top-up and that will give you 28 days to try it out. If you go ahead with the contract, order it on Three’s website and have the router delivered to your door. By law, this will give you a 14 day cooling off period to cancel. You can still buy the 50GB bundle on Eir, it’s the first booster option shown on the My Eir website. However, it now only lasts 30 days instead of 180 days. If you were managing fine with Eir’s 180 day bundle, it is extremely unlikely you will exceed 750GB in a month unless you start regularly streaming in 4K. I am also with Goldfish as my telephone provider and so far haven’t had any issue with using it over Three 4G. I don’t seem to have 4G with Eir, did have with Vodafone, have tried enabling the modem to 4G but doesn’t seem to pick up anything, is there a way of uploading screenshots of the settings as I’m not sure they are correct, the ISP provider has defaulted to meteor even though it is an eir sim, the speed is very good and consistent both during the day and evening except about 6 and 9pm as if eir is doing some background work. Your router probably has the Meteor network name in its firmware. My older Huawei B593 router does the same, displaying “Meteor” with an Eir SIM. Some routers don’t have a setting to force 4G. In this case, set the network preference/mode to Auto or LTE enabled. If it remains in 3G, then there’s either no or weak 4G in your area with Eir. If you would like me to double-check, uplaod the image to https://imgur.com and paste the “Share” link in your message. Excellent article, thank you. I’m using an unlocked Vodafone R216 to try various providers of mobile broadband in my ( poorly supplied ) area using PAYG sims. For all providers I have to put the router in the attic to get maximum of one bar of forced 4G signal. 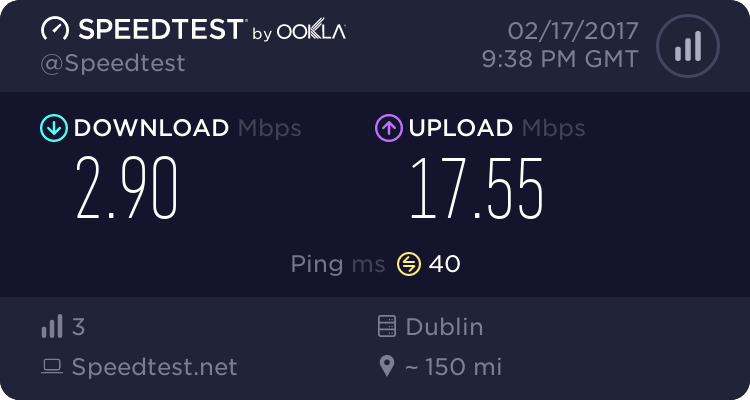 What I don’t understand is Eir supplying the strongest 4G signal but slowest download speeds of only 1-2mb (upload up to 10mb) at all times of day. I’m using the meteor APN as it’s an older Meteor sim. Vodafone 0-1 bars on forced 4G are giving up to 20mb download even at peak times. What’s the story with Eir? I’d prefer to use Eir as they won’t lock me into a 24 month contract unlike Vodafone, which is ridiculous entrapment for a sim based service. BTW, Three is barely detectable which probably rules out Rural Wifi. I suspect you are picking up interference on the Eir signal. For example, if you are midway between two 4G masts operating on the same frequency, the signal from one will interfere with the other. If you have a chimney block going through the loft or a large metal enclosure such as a filing cabinet, try running a speed test with the modem placed against each side, regardless of the signal reading as long as it remains connected. If the download speed climbs, then the culprit is very likely interference from another mast. In this case, a simple panel directional antenna will shield against the unwanted mast and improve your download speed. The R216 has two TS9 antenna connectors. If the download speed does not improve regardless of where you place the modem, there’s probably an uplink issue at the mast end such as a microwave uplink antenna that has gone off alignment. In this case, I suggest trying it forced in 3G mode. Based on my past testing, I’ve seen speeds of up to 26Mbps on Eir/Meteor 3G which I’ve never seen with 3G on Vodafone. 3G requires a full signal reading to get the most out of its speed, unlike 4G. If you manage to get any lock on Three 4G (where you can open a webpage or ping a host), you’ll probably get a decent Three 4G signal with a high gain outdoor antenna. To give an example, I cannot pick up Three 4G at all with a Three SIM in a phone or dongle in the loft. I am currently working off a 1 bar 4G signal using a carefully positioned LOG antenna, which gets 15-20Mbps depending on the time. Thanks very much for the detailed response. I apologise for taking so long to reply as the notification email went to my junk mail. I will take your advice and try a few things to I prove the eir and Three reception. Great site, very useful for keeping up to date with the new sim offers. You’ve saved me a good bit of money with your advice over the last year. I’ve been able to drop my vodafone DSL line and use a 3 mobile sim instead. And for my tablet when out and about (a few hours a week) I’ve been using the eir 50gb 180 day package. Which has worked out fine. But now that the 180 day deal has been discontinued what sim package would you recommend for a light or occasional user? Unfortunately, there’s no prepay mobile broadband plan that comes close for the amount of data that plan provided. The only remaining options I can think of would be to either tether from your mobile (if you have a large data plan) or the following option involving a Tesco Mobile phone SIM placed in your tablet. Tesco Mobile would work out at €30 for 150 days, but lacks 4G access and requires careful timing of when to buy add-ons or top-up: At the start, top-up by €15 to get 10GB for 30 days. After 30 days do the same again. After that expires, you’ll have €30 of credit. For the next 3 months (every 30 days), buy a 5GB add-on which uses €10 of credit and lasts 30 days. This works out at €30 for 150 days. This requires very careful timing as out-of-bundle data is charged at 10c/MB, i.e. set a ringing reminder to buy the new bundle on the last day of the current bundle. Some great info here, thanks. Excellent article Sean, I noticed it was published a while ago. My address is only able for 2MB broadband, so I am looking at Vodafones mobile broadband. I am concerned about coverage in the area, and if the speeds will be good. I am also concerned about the reach of the routers throughout the large home and different rooms. Do you have any advise about this and if TP links can be used with mobile broadband to extend coverage? Vodafone’s mobile broadband seems to be having issues in certain parts of the country (there’s a long discussion thread on boards about this), however, as I have not seen this issue for myself, I’m not sure whether it’s a fault with their router or the service itself. If you go for it, order it from their website and make sure to test it extensively during the first two weeks before the cooling-off period expires. Don’t order it in a Vodafone shop as there is no cooling-off period with contracts set up in-store. Wi-Fi coverage should be similar to using a DSL router. You can indeed use HomePlug kits to extend the coverage throughout the house, such as this TP-Link kit which uses the home’s electrical wiring to link back to the router. I don’t recommend using a plain Wi-Fi extender (which repeats the signal) as I’ve had bad experience with various brands either intermittently dropping the link or delivering poor throughput. The HomePlug Wi-Fi kits on the other hand tend to work well and typically deliver around 40Mbps depending on the Internet source speed. i’ve got a 4g sim router that i used for a year and it worked great . i’ve moved house and have no need for it . i’d give it to you for half price. it works great . cork/limerick area. I’m trying to get this working now but Three seem to be disconnecting the sim from the network after a few minutes. Is this a new thing that they’re doing does anyone know? In regards to Three Mobile Broadband bill pay service. This is not your monthly allowance limit (which I always thought it was), but an out of bundle limit similar to an overdraft which is set by three and most users have no knowledge of this, how much it is, nor is it clarified anywhere in the terms or website. Your account is subject to a credit limit (which may be obtained from Three Customer Services). We reserve the right to request an interim payment if we reasonably consider that you are likely to exceed your credit limit. If you do not discharge the required interim payment or if your usage is reasonably considered excessive by Three, we may suspend or disconnect your Three services. We may set a credit limit on your account until you have established a good payment history with us or if you fail to pay your account on time. We may increase, decrease or remove your credit limit without notice. If you exceed the credit limit we set, we may suspend any or all of the Three Services you use until you have made a payment to your account. You should not use the credit limit for budgeting as the amount you owe is not capped or limited by any credit limit we set. You may contact Three Customer Services at any time to find out your then current credit limit. “You’ll receive the alert once your data session ends. The system calculate all the charges and send all the text one by one per session once the data session ends. ” Quote from CS rep.
Fortunately my contract is up in January and I can switch to the 30 day rolling plan for more data and less than half the current bundle. Only question is, will it be as reliable as it’s previous packages? Thanks for replying. I set the modem to only connect to 4G but the behaviour is the same. It looks like 3 are scanning the network for modems and disconnecting them? If I restart the modem after a few minutes it works again but is disconnected shortly afterwards. it’s hard to say if 3 are now scanning the network for modems and disconnecting them, it could be . I would bet otherwise, you would have probably seen something about it in boards.ie . I can probably send you my modem or you can buy one yourself i think it cost me 90 euros. you can test it and my money is on it working fine. i would say get a router b593 with exgernal antenna (very important). it’ll pull the weak 4g signal a lot better. you can then lock it to 4g. Any good recommendations for a router with an external antenna? Are there any complications with usinf a Vodafone sim in any of them? My main recommendation would be Huawei B525, which is 4G+ capable, provides 802.11ac Wi-Fi and 4 x 1Gb LAN ports. It has two SMA screw-in antenna sockets if you intend installing an outdoor antenna for it. The router on its own has sensitive internal antennas. If you have a Vodafone phone that picks up 4G reception, the router will likely get a stronger signal in the same spot. If the SIM is a Vodafone broadband SIM (e.g. 150GB bill pay plan), it should automatically configure itself. If you are looking to test a Vodafone phone SIM in it, you must configure the APN to live.vodafone.com straight away, otherwise Vodafone will charge any Internet usage as out-of-bundle data. After you unbox it, insert the SIM card (Huawei B525 uses a micro SIM size) and switch on. The Wi-Fi password is printed on the back of the router. With some other router brands, you will need to manually enter the APN or access point name, which is hs.vodafone.ie for their 4G broadband plans. carphone warehouse have an offer during Feb 2019: MAKE THE MOVE FROM TESCO MOBILE. Move from Tesco Mobile to Three’s 30 Day SIM Only plan and GET YOUR FIRST YEAR HALF PRICE. Just €15 a month for all you can eat data, unlimited calls and unlimited texts.*. This is the cheapest ayce data deal in Ireland. In reference to you mentioning distance to mast limiting (4g down to 3g) for broadband routers. Any idea of the distances involved? The 4G limit seems to be around 20km. I’ve heard of people being able to connect fine to a mast over 10km away. However, when I was testing at someone’s house where the only 4G masts available were across a bay over 20km away, only mobiles were able to connect in 4G mode. If I forced the router in 4G-only mode, it would endlessly show no signal, even when temporarily set up outside with clear view over the bay. The 3G limit seems to be similar to GSM, i.e. around 35km, after which a connection will fail regardless of the signal strength. Thanks Sean I’m only about 10km away from vodafone, meteor and three so have plenty to choose from so! We are moving back into our refurbished house in the next couple of weeks. We had wired broadband but it dreadful. There are no plans to improve this situation! I was looking at the Vodafone 4g home package and tried to test the signal with a vodafone sim (VF X plan) using Net Perform speed test as per your recommendation. The coverage map for VF for 4G shows it as fair but good within a few hundred yards at fields to our rear. The phone displays a 4G symbol but the test results show a 3G Network! I tried it in several locations in and outside the house today at around 4.30pm. The best result I got outside was 35Mbit/s (DownL), 16.7 Mbit/s (UpL) and 25 ms ping. This dropped to (best result) 13.4Mbit/s (DownL), 3.1 Mbit/s (UpL) and 26ms ping. Im assuming that the amount of insulaton is playing some part in this. I dont know if these results are good bad or indifferent. Obviously it would need an external antenna but I have no idea are these results are good enough for streaming movies for instance. I think the Net Perform app is misreading the network mode. 5Mbps is about the maximum real world upload speed possible with HSPA+, so by getting 16.7Mbps up, this is definitely a 4G connection. Movie streaming needs roughly 5Mbps sustained download speed for HD streaming. For example, YouTube has no problem playing 1080p with a 5Mbps connection, as long as nothing else is downloading or streaming at the same time. Try the 50MB download test on testmy.net during peak time such as between 8pm and 10pm (direct link to start this 50MB test), in the spot you got the best results on NetPerform and let it complete. TestMy doesn’t filter out dips or try to measure the peak like some other tests do with lots of simultaneous connections, so the result it gives is the sustained speed you are currently getting. If this is over 5Mbps, this is plenty for streaming HD. The Vodafone 4G Home Package will come with a dedicated router (Huawei B528 at present) and these generally have more sensitive built-in antennas than what’s built into the cramped space in a phone. So I suggest giving it a try before considering any antenna. Many thanks for clearing that up for me. I’ll do the Test my as suggested and let you know how I got on. Did as suggested but around 6.30 to 7 this evening. In the house 4G symbol disappeared and H appeared, ended up with 1.5Mbps on the 50MB download. I could not get a 4G symbol unless I was at a window. Outside south facing gave 7.15Mbps and east 6.65Mbps. I ran this test a couple of times with quite similar results. North and West have banks of high trees going uphill so I did’nt even try that. In the attic gave 7.1 Mbps again over 50 MB. Most of the Cat5 cable is terminated in the attic and there is power so that is quite handy. Access to the roof is obviously easier so puttting an antenna is not a major problem if needed. I’m assuming that an outside antenna should improve things if necessary in the future. If an antenna was requried in the future what would be suitable for the VF (Huawei) router? That sustained speed is plenty for HD streaming and as you’re getting a few Mbps over, you’ll unlikely have a buffering issue if something downloads in the middle of a film. 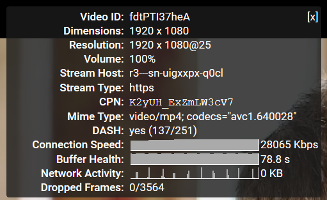 That speed is likely enough for two simultaneous 1080p YouTube streams as most videos are encoded with the more efficient H265 encoding that averages between 3Mbps and 4Mbps with 1080p video. The Vodafone router has two TS9 ports on the back. If you decide to get an outdoor antenna, I suggest getting one with SMA connectors and a pair of SMA to TS9 adapters. This way if you later replace the router to something that has SMA connectors (which are more common), you can just unscrew the TS9 adapters and attach the SMA ends directly. Previous Previous post: Why do all the speed test websites differ, which to use?